Small business can make big, worldwide impact, but how is your impact? The Impact Assessment Package will help you understand where you are doing well and where you need to make improvements to help you Lead Like A Queen (LLAQ). 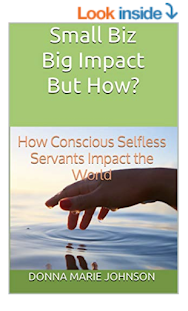 The LLAQ Impact Assessment Package is personalized and customized to your specific small business needs based on the principles shared in my book, "4 Basic Areas for Better Small Business Leadership: How Conscious Selfless Servants Impact the World". Only 4 New Client Seats Available for Spring Session. WHEN DO YOU REGISTER FOR SPRING SESSION? Your Investment is $297 (Individual* Price). Pricing for partners and teams is also available.